We have two nuggets of refund news for you today. 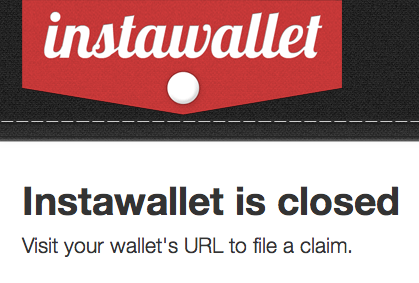 First up, Instawallet has officially closed its claims process, after opening it 91 days ago. The bitcoin wallet was created in April 2011 and was designed to offer a speedy alternative to the other available wallets. It required no signup, it simply generated a secret link when users visited the site – this link was then the only way the user’s wallet could be accessed. Fast-forward two years and the site’s security was breached, with an intruder gaining access to all of the hidden urls, so the company closed and told customers to file a claim form in order to get their funds back. Users were told that those with under 50 bitcoins in their account would get a refund, but those with more than this would have their claims dealt with on a “case by case and best efforts basis”. Instawallet’s latest update explained it is now drawing up a final “payments table” which it will then crosscheck with each claimant to make sure no mistakes are made. Meanwhile, some Bitcoin-24 (BTC 24) customers are having to wait around to get their funds back too. The latest statement from the German exchange’s lawyers Röhl, Dehm & Partner explains a decision made by the Polish Public Prosecutor’s Office that a large proportion of the exchange’s money can be returned (but some still cannot). At the end of April, BTC 24’s German and Polish bank accounts were closed following the hacking of customer accounts, suspected fraud and the use of accounts for illegal purposes. The German accounts were reopened in late May, but the Polish authorities have taken more time to mull things over. But unfortunately this will only be possible once the Polish Public Prosecutor’s Office has given us and our colleagues in Poland access to the files. To protect all profit already earned, it is critical that our client avoid paying out money to those users who are connected with the suspicious accounts. The statement also explains that all customers entitled to get funds back from the German bank should receive confirmation within the next two weeks.